I've found a blog dedicated solely to a phenomenon of which I've been completely unaware until now: signs on which all letters are capitalized except for "L." Apparently it happens, and apparently some people think it's funny. My only previous association with curious use of "L" and capitals has been my editor's instruction to never use the word "ill" in a headline, as most fonts render the capital "I" and lowercase "L" indistinguishable to the point that it looks like the Roman numeral for three. This post title is a good example, but this other "L" thing is a subject for an entire other blog, I suppose. 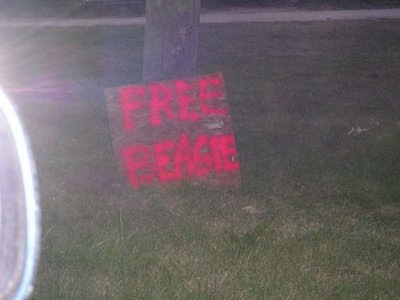 I'm especially fond of this sign, which advertises a "free beagie." Read further, if you like, at lowercase L.